Syrian Army Resumes Operation Against ISIS South Of Mayadin, East Of Sukhna-Deir Ezzor Highway (Map) 5 out of 5 based on 15 ratings. 15 user reviews. The Syrian Arab Army (SAA) and the National Defense Forces (NDF), led by the Tiger Forces, have resumed their operations against ISIS near Mayadin city. According to pro-government sources, government troops have passed about 30km southeast of it. The SAA and the NDF have also advanced against ISIS and reached the settlements of Bir Duhul and Al-Duhul. The SAA and the NDF faced little ISIS resistance during their advance because a major part of ISIS members had withdrawn from the desert area. ISIS is now focusing in clashing with government troops in al-Bukamal. The government advance will put an additional pressure on ISIS members in the border area and would contribute to a joint effort of the SAA and Hezbollah to secure al-Bukamal. Syrian Army and Hezbollah must hit TelAviv with strong, Long Missiles. Sooner better. As long as devil-israel existiert, there will be no peace there. Devil israelis will never let the syrians in peace. Looks like there is an issue with cooperation in SAA Tiger force and SAA other forces and its allies. Looks like there is none. Rather competition. When government troops advanced from South and liberated al-Bukamal city, SAA Tiger Force and NDF did not advance from North the same time. Rather waited, this allowed ISIS to move its troops to al-Bukamal city and eventually government force have been pushed out of the city. 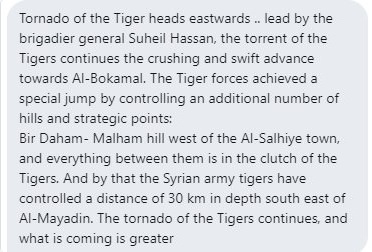 SAA Tiger and NDF force waited till other government forces are bleed to death in Al Bukamal. Now Tiger and NDF forces have easy path as most of ISIS are in al-Bukamal city. The art of war. I doubt there are an problems between SAA forces, but each have a role to play. Infantry vs Paras blah blah. 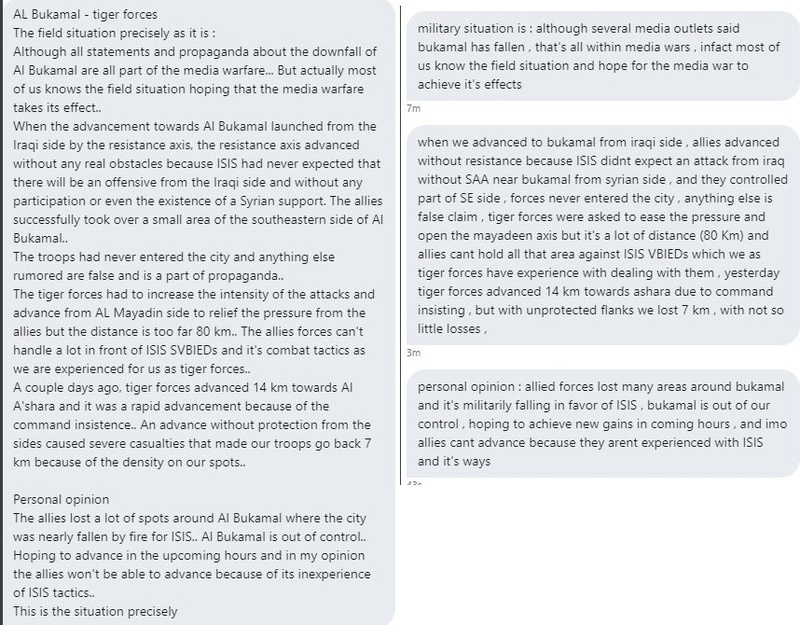 Considering that the Tiger Forces had been used for urban combat, the hardest form of warfare in many ways, methinks they deserved some time off afterwards. They’re human beings, and human beings need rest from time to time. Keep throwing them into battle time after time after time and their effectiveness will decrease dramatically. If the anonimous sources I have are true, al-Bukamal has already been promised to the illegal US colonial, imperialist invasion and occupation forces by Putin. This operation is a waste of resources and time and just a sort of consolation price with no strategic relevance, while giving tome for the Western foreign Zio-Nazi forces to take al-Bukamal themselves, as had happened in Taqba, Raqqa, the Jafra oil and Omar oil fields. My guess is you work for those forces of darkness , I say you are wrong , be gone . I have always been right in my predictions. I don’t work for the forces of darkness. I’m afraid Putin has turned his back on the Syrian government and people. Only Iran and Hezbollah are standing firm in their support for the elected Syrian government. That’s why the US and the Zionists want them out, and not Russia. I add, unless of course US and co special forces are already at al-Bukamal. I give much relevance to the news of many military helicopters landing at al-Bukamal air base immediately prior to the retreat of the Syrian forces from there. Where they truly Syrian and Russian? With Russia having total air supremacy over the area this situation is unacceptable. It is obvious that Russia failed to provide air cover to the advancing forces and videos from outside the city prove that. The answer to why Russia has been absent in this crucial battle leaves one to speculate that indeed there was a behind the scenes agreement between Putin and Trump to let the illegal US/Zionist colonial imperialist invasion and occupation forces to take over al-Bukamal and impose a total land blockade on the Syrian government controlled areas to force the Syrian govenment to abdicate. Al-Bukamal is too important for the Syrian government and the resistance axis to be let to fall under the US/Zionist tyranny. Therefore Syria together with its true friends Iran and Hezbollah and the PMU need to throw everything they have to reclaim the city, whatever the cost, whatever the casualties. All other fronts cannot provide any true bargaining power to the elected Syrian government because however you look at it, Syria is surrounded by hostile or US/Zionist vassal countries. Only the connection of Syria to Iraq through the Deir Ezzur – Baghdad highway can safeguard Syria’s survival, both politically, economically and militarily. Russian Aerospace conducted many sorties using strategic bombers and cruise missiles against Al Bukamal over the past week, so I don’t think they agreed to cede the city to US. I for one am glad that ISIS is making a stand in Al Bukamal. Saves the SAA the effort to go hunt them down in the desert later. With great trouble also comes great opportunity. That’s how I would have spinned it. Yes, it is Difficult to chase ISIS around in thousands of square Miles of empty desert. *Best to go “Full Grozney” on BuKamal and level it rather than take more casualties from ISIS counterattacks. **Then declare victory and pull back to Deir Ezzor which is a manageable area with an airbase. Ahora lo mas importante es que el ejercito sirio y sus aliados populares recuperen lo antes posible el control total de la ciudad de Al-Bukamal, lo que reforzaría el control del gobierno en la frontera con Irak, el debilitamiento definitivo del Daesh y el impedimento que las FDS sigan expandiéndose ilegalmente. Al mismo tiempo, las unidades militares situadas cerca de Palmira, podrían iniciar la conquista de los territorios desérticos de Deir-Ezzor, para completar su conquista. En cuanto esto finalizara, las Fuerzas Tigre deberían de moverse hacia Idlib, para arrebatarle la ciudad y los alrededores a los rebeldes islamistas, y acabar de una vez con esta oposición creada en las dictaduras del golfo.